Mello Skateboards is a division of DWN Limited and part of The Dash Group. How do the LED’s work? What is the life expectancy of the wheels? My LEDs are not working, what am I doing wrong? How do I maintain the performance of my wheels? Will Mello wheel sets fit on my board? Are Mello wheels suitable for riding at night? How can I be sure that this site is secure? The simple answer is no! The Mello skateboard wheels power themselves from a natural source of energy which is available in abundance… you. Purely by riding the board, enough energy is produced and therefore no artificial power is required. How do the LED wheels work? Now for the science part – pay attention. 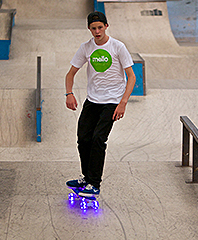 Through clever innovation and design, each Mello skateboard wheel contains its own special bearing set which harnesses the kinetic energy, a natural by-product which is produced from riding the board, and recycles this into an electrical charge for the LED bulbs housed within the wheel. In a nutshell, if the wheel is spinning, the LED’s will be powered. The wheels are designed and developed using the highest specification materials and techniques. The wheel itself is made from durable Polyurethane (PU) material with a high ‘durometer’ (durability) rating of 78a and built to last. 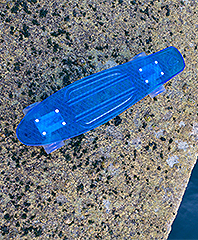 As explained in more detail in the previous section, the LED core housed within the PU is completely self powered and as long as you ride the board, the LED’s will always have power. The LED bulbs themselves are designed to last and are rigorously tested to ensure a minimum life of 100,000hrs running time. In the first instance, this is usually the result of loose wheel nuts. Try tightening your wheels nuts with a suitable socket or spanner or skateboard tool until they have no side to side ‘play’. Take care not to over-tighten the nuts restricting the wheel from moving freely. If after tightening the wheels the problem still persists, remove the wheel from its truck, remove both bearings from inside the wheel collar and clean thoroughly to remove any dirt or obstructions which may be affecting the bearings performance. How do I maintain the performance of my bearings? To keep your bearings working freely and avoid the risk of injury, bearings should be kept clean, dry and lubricated to reduce friction, wear and keep their movement as free and smooth as possible. Although the bearings are designed and developed to give high performance while also providing durability. As with all bearings, these are built up of small moving parts and regular maintenance of these can significantly improve performance and lifespan so you can enjoy your mello wheels for years to come. For optimum performance, maintenance should be carried out regularly and as often as possible, it doesn’t take long. Remove the wheels and bearings from the trucks as described in the previous section (you should have 8 bearing sets in total). Use a weak solvent, detergent or warm, soapy water with a lint free cloth (or old toothbrush if you have one) to clean your bearings of grit, grim and other contaminates. One thoroughly cleaned, dry immediately with your lint free cloth. Using a suitable oil based lubricant with a straw on the nozzle, spray generously in and around the bearing and wipe off access lubricant. Spin the bearing between your finger to ensure the lubricant gets around all parts. Replace the bearing in the wheel and hey presto! Will Mello wheels fit on my board? Yes, Mello LED wheels are designed to fit almost any truck and can be directly interchanged at the twist of a nut. Mello LED wheels are for decorative use only and should not be relied upon for visibility or illumination purposes in unlit/dark conditions. We strongly recommend that you do not skate if visibility is poor. During these hours a member of staff will be available to help with any enquiry you may have. UK delivery is free of charge when you spend over £25, for orders of a lower value we charge £6 to deliver your goods. We pack and dispatch all stock orders received before 3:30pm on weekdays (11am Saturday) the same day. Orders received after this time will usually be dispatched the following day. Orders are usually sent via 24hr courier depending on their size and value. You should therefore typically expect your goods to arrive between one and two days after placing an order. You can cancel your order at any time and we will refund your payment in full. If you are dissatisfied for any reason, after you receive your order, you may return it to us within thirty days and we will also refund your payment in full. If your order has been received damaged or faulty please do not hesitate contact us to arrange a replacement or refund. Unlike many other e-commerce sites, Melloskateboards.co.uk has a registered SSL certificate which applies from the main store page onwards. This means that every time you make a click, your data is encrypted using 128-bit technology which offers the highest level of security. You can therefore rest assured that communications between your browser and this site’s web servers are private and secure. For more information please click on the padlock in your internet browser. How does the payment processing system work? All payment processing is handled by Sagepay, a subsidiary of Sage, (www.sagepay.com), which is the largest independent Payment Service Provider in the UK and provides secure online facilities for thousands of businesses across the country. All payment processing pages are hosted by Sagepay and offer the highest level of compliance under the Payment Card Industry Data Security Standard (PCI). Sagepay adheres to the most stringent levels of fraud screening, ensuring that your details remain secure throughout the transaction process. As part of our ongoing commitment to maintaining the highest levels of security we also use the 3D Secure Authentication system. 3D Secure is the latest fraud prevention initiative launched by Visa and MasterCard and is the culmination of the “Verified by Visa” and “MasterCard SecureCode” schemes. 3D Secure creates a more secure method for authenticating your details at the time of the transaction by giving you the option to register your card (if you have not already done so) and then to verify your transaction, by entering your password or pin. Once you have registered your card for the first time, you can use your password/pin to verify your transaction every time you make a purchase from a website that uses the 3D Secure system. For more information, please contact your card issuer.